WhatsApp has finally introduced stickers feature in the latest update. It's fun to use stickers while chatting with someone as they can help you express your emotions better than emojis and text. WhatsApp has added many built-in sticker packs. You can also download stickers pack from third-party apps and add stickers to your favourite list. Here's everything you need to know about the new WhatsApp stickers feature. 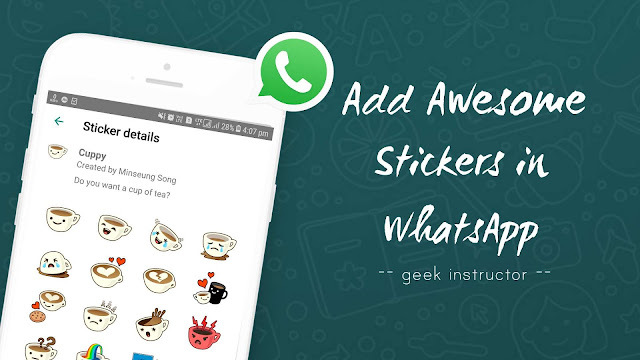 Earlier, WhatsApp stickers are available in the beta version only. But now WhatsApp has rolled out this feature in the regular version also. First, go to Google Play Store and update WhatsApp with the latest version. 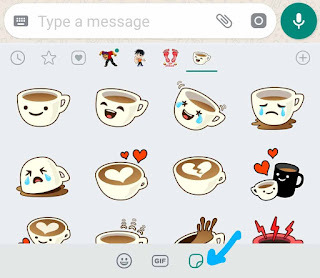 If the latest version doesn't have stickers feature, you can download the beta version from WhatsApp's official website. After updating the app, launch WhatsApp and open any chat where you want to send stickers. Tap emoji icon at the bottom of the screen. Here you can send WhatsApp stickers. Like emojis, the stickers you have sent are added to the recent/most-used list of stickers under clock icon. Download new WhatsApp sticker packs - There are around 12 built-in sticker packs available on WhatsApp. 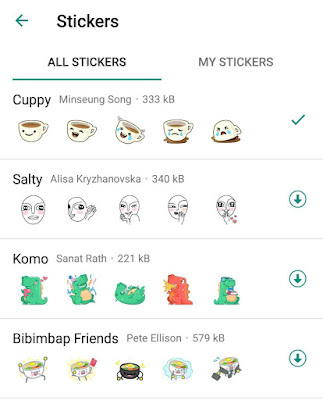 By default, WhatsApp has installed only one sticker pack named Cuppy. If you want to download other WhatsApp sticker packs, tap the + icon and then tap the download icon next to the sticker pack you want to download. 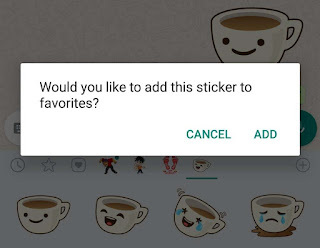 Add stickers to your favourite list - By adding WhatsApp stickers to your favourite list will make it easy for you to access them quickly. To add a sticker to your favourite list, long-tap on it and then click "Add" button. The stickers you have added on your favourite list will appear under star icon. Rearrange WhatsApp sticker packs - If you want to rearrange the sticker packs, tap the + icon and move to the My Stickers tab. Now drag up and down to reorder the sticker packs. Delete WhatsApp sticker packs - You can also delete WhatsApp sticker packs that you don't use anymore. Simply tap the + icon and move to the My Stickers tab. Now click the delete icon on the sticker pack you want to delete. That's it. 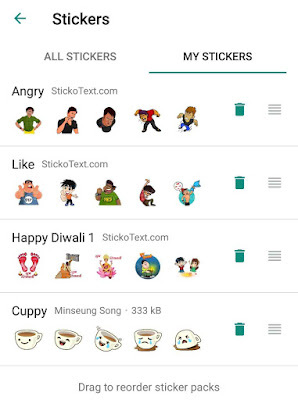 You might have seen many stickers which aren't available on WhatsApp store like Diwali stickers. You can add them from third-party apps. StickoText is one of the best apps for WhatsApp stickers. Download and Install StickoText app from Google Play Store. Open the app and tap on the + icon next to the sticker pack you want to add. So that's all you need to know about the new WhatsApp stickers feature. If you are facing any problem in adding WhatsApp stickers, let us know in the comment section.